The lesser electric ray (Narcine bancroftii) maintains an incredible charge on its head and a charge equal in magnitude but opposite in sign on its tail (Figure 19.38). (a) Sketch the equipotential lines surrounding the ray. (b) Sketch the equipotentials when the ray is near a ship with a conducting surface. (c) How could this charge distribution be of use to the ray? Figure 19.38 Lesser electric ray (Narcine bancroftii) (credit: National Oceanic and Atmospheric Administration, NOAA's Fisheries Collection). Please see the solution video for parts (a) and (b). c) Electric rays can shock or kill predators or prey. This is College Physics Answers with Shaun Dychko. 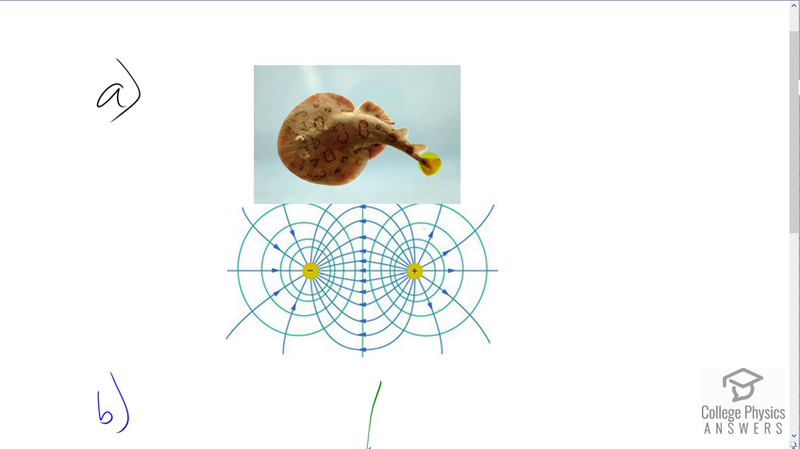 This electric ray with some charge in its head and then opposite charge of equal magnitude in its tail would have electric field lines and equipotential lines similar or the same as basically to this picture for an electric dipole and then if there is a conducting ship nearby, there would be an equipotential lines along the surface of the metal ship because a piece of metal is gonna have an equipotential line along the surface and the electric field lines would enter that surface at right angles and then penetrate through the surface and come out at right angles on the other side and then go in at right angles and yeah that’s the main features in an equipotential line around the surface of the ship and then the electric field lines are bent such that they enter and then emit from the ship at right angle and electric rays could shock or kill predators or… or food with this charge distribution.